You were very cruel to me. Good riddance...I hate you. In the words of the honorable Tim Riley, 2009 just can't come to a close fast enough and I am more than ready for the new year. 2009 was truly my family's darkest year and yet we've come away from these experiences better human beings and we take away gifts that can only be received in times of overwhelming sorrow. 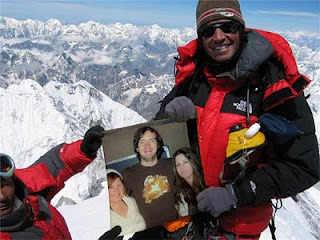 2009 was not a total loss however and toward the end of the year (The Former) Lovely Teenaged Daughter and I managed to experience what it might be like to be on top of the world when we had the opportunity to meet a great man. A man responsible for some of the most beautiful songs of love and loss ever written. Goodbye 2009, here's to a great 2010. Thank you for reading, and happy New Year from the staff at Waist High!